Cable Ferrules: Wire Rope Fitting Designed To Create Eye or Loop. Swage sleeves (also known as cable ferrules or duplex/crimp sleeves) are wire rope fittings that are commonly used to form loop ends or wire splices. Stop sleeves, or button stops are used as termination ends to prevent wire from fraying, As much more solid alternatives to wire clips and thimbles, these fittings can be easily swage by hand, also with hydraulic or battery powered swage tools utilizing swage dies. 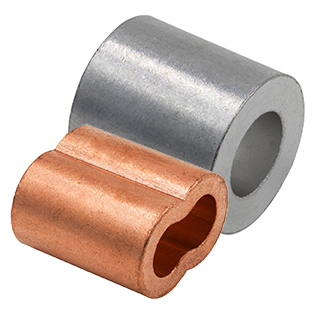 Swage sleeves are available in plain copper, zinc plated copper, tin plated copper, aluminum and stainless steel material. Our duplex and oval swage sleeves adhere to the following Mil-Spec standards, MS51844-20, MS51844-60 and MS51844-80 series. RoHS and DFARS compliant, our USA made swage sleeves can meet a variety of rigging or cable assembly needs.